In the year 1890, there were 34 Catholic churches in the City of Baltimore. Cardinal Gibbons felt that for the good of the Catholics, who were so far removed from a church, he should establish a parish in the south end of the City (which was then Anne Arundel County). A little church built for the factory town of Curtis Bay was originally not intended as a Polish parish. Since there were many Irish Catholics residing in the area, he chose the Rev. James R. Matthews, then the assistant pastor at St. Mary’ Star of the Sea parish in South Baltimore to take such steps as necessary to begin a new parish unit. Father Matthews brought to his work a great deal of priestly zeal coupled with initiative and prudence. The parish was functioning before the end of the year. The records list the first funeral on the 3rd of August and the first baptism on December 25, 1890. In the report that Father Matthews made to the Cardinal covering the year 1891, he indicated a total Catholic population of some 350 souls and during the year 20 infants were baptized. In a short space of time, he had not only acquired a site, but had also completed construction of the church, with a belfry, and a house in which the priest could live. The first marriage was celebrated on February 4, 1891. In February 1892, Father Matthews was transferred by the Cardinal to begin another new parish, St. Cypian’s in Washington, D.C. At that parish he began again, the work of organizing a new parish which he served faithfully and devoutly for the remainder of his priestly years. Rev. Thomas E. Gallagher succeeded Father Matthews and conducted the affairs of the parish until 1895. Father Gallagher entered zealously into his labors, but very soon was confronted by insurmountable difficulties. The principal industry at Curtis Bay at that period was the sugar refinery, and this gave employment to many of Father Gallagher’s parishioners. It was, at first, crippled by fire. After being rebuilt, the greater sugar plant of Philadelphia fearing the prosperity of their younger brother, soon forced it out of existence. Its failure was a severe blow to Curtis Bay, for most of the English speaking residents were forced to seek employment elsewhere. As the English speaking parishioners moved out, a great inlux of Poles and small numbers of Lithuanians, Bohemians, Slovaks, Slovenes and Ukrainians moved in. This resulted in lessening the Catholic population and a modification of the parish. The little church was in debt – almost $7,000 was still owed on it – and this meant a great burden for the parish struggling as it was under such difficult conditions. The pastor debated whether it was not better to endeavor to attach it as a mission to one of the larger parishes. Before any move of this kind was made, however, Father Gallagher was succeeded by the Rev. Andrew A. Duszynski. The real cause of Father Gallagher’s inability to cope with the new conditions was the change in nationality and the breakdown of communication with his parishioners due to the language barrier. Father Duszynski was a very pious man and wanted to bring new life to the parish. He was a good manager and due to his knowledge of foreign languages he was able to bring people together and very soon the majority of the heavy debt was liquidated. He had charge of the whole area around Wagner’s Point and Fairfield and had no means of transportation. Soon his health failed and in 1904 he was forced to resign. He remained in retiremenbt until 1912 but never regained his health. He returned to St. Athanasius and stayed with Father Sandalgi and under his care until he died on December 26, 1912. 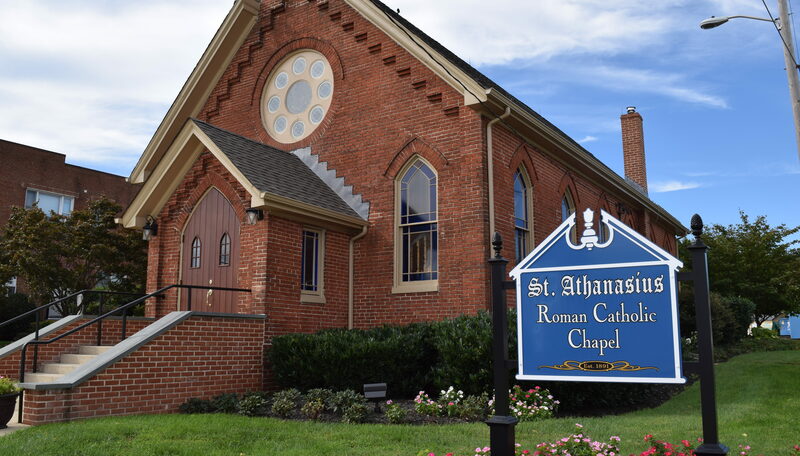 During these years, Catholic people must have been attracted to St. Athanasius parish because the records indicate that the Catholic population had grown from 350 in 1893 to more than 700 souls ten years later. In the same period of time, the number of baptisms had increased from 20 to more than 60 annually. Rev. Andrew F. Marzecki succeeded Father Duszynski as pastor and was in charge of the parish for the next six years. During his administration, there continued to be gradual growth in the number of Catholics in the wide area that the Curtis Bay priest was endeavoring to serve. To understand better how extensive the parish was, we have to realize thiat it included, besides the present territory, all that territory within the area which is Fairfield, Wagner’s Point, Brooklyn, Linthicum, Glen Burnie, Riviera Beach and all surrounding beaches. Although there was growth in the parish, the people were poor. Many had to no jobs and they found it difficult to support the church. Weighed down with worry and anxiety for his flock, Father Marzecki, although still a young man, having been raised to the priesthood only nine years before, died on July 20, 1909. During his pastorate, however, Father Marzecki was able to help form the parish of St. Aldabert’s in 1907, the adjoining factory towns of Wagner’s Point and Fairfield were detached from St. Athanasius when the family of Martin Wagner, the Catholic founder of a large packing firm at Wagner’s Point offered a parcel of land and $10,000 for a church to be built as a convenience for his employees. The church and a rectory were built in 1907. St. Adalbert’s was entrusted to Father Charles Kotlarz, a product of Lovain and the only pastor that the church ever had. Over two-thirds of his flock were Polish. On August 1, 1909, Rev. Paul J. Sandalgi was appointed to succeed Father Marzecki. Although Father Sandalgi was newly ordained, he was assigned to the polyglot parish of St. Athanasius due to his knowledge of many foreign languages. He was able to serve not only the Slavic groups of the Roman Rite in Curtis Bay, but also the Oriental-rite Catholics who settled here and in other parts of Baltimore. In 1910, after a fire had destroyed the small wooden church of St. Peter and St. Paul, Father Sandalgi negotiated to buy an empty Episcopal church and parish house at Church Street and Fairhaven Avenue. It is there that he helped to establish the present St. Peter and Paul Ukrainian Catholic Church. Father Sandalgi also helped to establish St. Michael’s Ukrainian Catholic Church in southeast Baltimore in 1913. Father Sandalgi took up his duties and brought to the work a rare combination of priestly sanctity, zeal for souls, wide learning and perfect tact that immediately began to bear fruit. Traveling long distances, Father Sandalgi placed himself at the service of the faithful wherever they were to be found in his extensive territory. In 1914, to care more effectively for their needs, he established a mission church, St. Rose of Lima, in Brooklyn. So rapidly did this develop that in 1917 it became independent and yet another parish was carved out of he area served by the pastor of St. Athanasius. St. Rose of Lima with the Church of Glen Burnie, Holy Trinity, as its mission, became a separate parochial unit. By 1919, yet another mission church was started in Riviera Beach, St. Jane Frances de Chantal. Under Father Sandalgi’s leadership, the parish began to develop. In 1910, Curtis Bay was not a part of Baltimore City, so Father Sandalgi, with the aid of Konstanty Aleksalza, established a school for the Polish children of Curtis Bay. It was under the supervision of the pastor, and managed by the parents of the children who attended. By 1922, the enrollment was 71 pupils, 33 boys and 38 girls, under the teacher Miss Tillie Tomalska. In 1913, two Masses were sufficient to meet the needs of the people on Sunday and Holy Days of Obligation. By 1941, it was necessary to have five Masses. The Pallotine priests from Jessup, Maryland began to assist at these Masses. In 1910, the Mission Helpers of the Sacred Heart began coming weekly to conduct classes in religion for the children, added by four young men who wee studying for the priesthood, and 9nine lay teachers. These religion classes were held not only on Sunday but on Wednesday and Saturday as well. During the Father Sandalgi years, an Altar Society, which had been formed by Father Duszynski, was reestablished. In 1920, a Holy Name Society was founded by the English speaking men of the parish. The boys of the parish, willing to emulate the good example of their elders, formed a Junior Holy Name Society the following year. It was under the guidance of a seminarian from St. Mary’s Seminary in Baltimore. The Polish men of the parish formed themselves into a society as did the women of the parish. Its societies flourished and although many nationalities were represented, perfect harmony reigned among the parishioners. For a brief period, Father Sandalgi was called to Rome between September 1924 and June 1926 and he was replaced by Rev. Casimir P. Loisnski. The Holy See called Father Sandalgi to Rome to have the benefit of his knowledge in matters affecting the Oriental Church. Six months after his return, Father Sandalgi was sent back by His Excellency the Most Reverend Archbishop to his beloved St. Athanasius, where he resumed his labors for th sous to whom he was deeply attached and whose needs he so thoroughly understood. The people of Curtis Bay were quit poor, therefore, they were never able to build and support a school. The families that desired to send their children to parochial school sent them to St. Rose of Lima. The war years (1941-1945) brought a great influx of Catholics from other states to work in the defense plants in Curtis Bay. Father Sandalgi received permission to start a fund for the building of a school. The fund was started with the help of Father Raphael, but Father Sandalgi was unable to do anything about the building before he retired. Father Raphael was young and energetic. He came as as a seminarian from the Franciscan Monastery in Ellicott City for two years. After he was ordained, he stayed on for eight more years until Father Sandalgi retired. Father Raphael belonged to a teaching order of priests. It was at this time that he was sent to Buffalo, New York, to teach in high school. In 1955, Father Sandalgi retired due to his age and failing health. He was succeeded by the Rev. Chester J. Czyz who directed the construction of the present church. It was designed to be a school, but those plans had to be dropped for financial reasons and for the decrease in enrollment. Father Czyz had the first associate pastor ever assigned to St. Athanasius, Rev. Walter Janocha. Father Janocha was soon replaced by Rev. Eugene Wesolowski. By 1958, Rev. Stephen Blazucki replaced Father Wesolowski and remained for many years. It was during the “Father Czyz Years,” that St. Athanasius had a real growth spurt. Father Czyz started a building campaign that saw the construction of a new hall and church and the renovation of the rectory to double its original size. Father Czyz died on July 28, 1965. He was greatly mourned by the people of Curtis Bay. With the death of Father Czyz, Father Blazucki was elevated to pastor of St. Athanasius. He had been moderator of parish organizations and fundraising benefits designed to pay off the debt on the new church and the hall. His leadership was highlighted by $47,000 worth of improvements and repairs to the parish facilities. His ability to pay the construction company within a year without contracting a loan showed the loyalty of the parishioners, their love for their pastor, and their generosity toward the church. Father Blazucki fostered the spirit of ecumenism in Curtis Bay. He invited the pastors of the Curtis Bay Methodist Church and St. Paul Lutheran Church to participate in ecumenical services. In a deeply moving ceremony, the community of Curtis Bay was united in their spirit of fellowship and bond of charity. “Father Steve, by which he was affectionately known to his parishioners, died on November 5, 1983 after a lengthy illness. Rev. Stephen Melycher, who was a retired priest who was living in the area, began to assist Father Steve during his illness. After Father Steve’s death, Father Melycher was appointed administrator of St. Athanasius until a new pastor could be named. On May 2, 1983, Rev. Brendan Carr was named as pastor of St. Athanasius. He was their first non-Polish priest at St. Athanasius in 88 years. What was once the parish that represented the richest ethnic mix in the Archdiocese was becoming much more Americanized. A great deal of work needed to be done to the buildings and properties when Father Carr arrived. He began to have the buildings repaired and formed work parties to cleanup and landscape the grounds. Under his leadership, liturgies were beautiful and the parish began to flourish. July 1994 Rev. Timothy B. Klunk was assigned as Pastor. September 1994 A newly formed Parish Council was established. 1995 An air conditioning system was installed in the Main Church. January 1996 A handicap accessible ramp was installed at the back entrance of the Main Church. 1997 The carpet in the Main Church was replaced due to water damage from leaking windows. January 1998 Father Tim directed the Heritage of Hope Campaign which was an Archdiocesan capital campaign. The Heritage of Hope Campaign funds were to be designated toward the replacement of the windows in the Main Church, which were to be designed by Father Tim. Father Tim received permission from William Cardinal Keeler to design the windows in the Main Church. February 2000 The parish entered into a contract of sale for a lot owned by the parish located between Prudence Street and Fairhaven Avenue. February 2000 Rev. Robert A. DiMattei, Jr. was assigned as Temporary Administrator. February 2000 Ron Thompson was assigned as a Deacon Intern under the supervision of Father Rob. July 2000 Rev. Robert A. DiMattei, Jr. was assigned as Pastor. May 2001 Ron Thompson was ordained as a Permanent Deacon and assigned to St. Athanasius. June 2001 Mary Beth Barnes was hired as the Pastoral Associate and Director of Religious Education. June 2001 The contract of sale for the lot between Prudence Street and Fairhaven Avenue was declared null and void because the buyer did not meet deadlines outlined in the contract of sale. Father Rob continued to raise funds for the completion of the window project and asked Father Tim to complete the artwork drawings for the windows. March 2002 The windows were replaced in the Parish Office/Rectory. September 2002 The dedication of the newly painted windows in Main Church by Bishop Gordon Bennett. September 2002 A campaign begins for the renovation of the sanctuary in the Main Church. 2003 The Main Church was renovated with new front doors and addition of a new interior entrance to Main Church. The funds for this project were donated by Gregoski and Alban Families. January 2005 Rick Clemens was assigned to St. Athanasius as a Deacon Intern under the supervision of Father Rob. May 2005 Rick Clemens was ordained as a Permanent Deacon and assigned to the Catholic Community of South Baltimore. October 2005 A campaign began for the restoration and renovation of Old Church Chapel. November 2005 The dedication of the newly renovated sanctuary by Bishop Denis J. Madden. January 2006 The renovation and restoration began in the Old Church Chapel and the purchase of a new maintenance garage. December 2005 The dedication of the new Walker Digital Organ in Main Church and the dedication of the newly renovated Old Church Chapel by Bishop Denis J. Madden. February 2008 New pews were installed in Main Church. The funds for this project were donated by Andrew and Joyce Walter. June 2008 The parish received a Historical Preservation Award from the Baltimore Heritage for the renovation and restoration of the Old Church Chapel. 2008 A new entrance with a waiting area and handicap accessible ramp was constructed for the Parish Office . December 2008 Mike Dodge was assigned to St. Athanasius as a Deacon Intern under the supervision of Father Rob. May 2009 Mike Dodge was ordained a Permanent Deacon and assigned to St. Athanasius. January 2010 Father Rob was assigned as Pastor of St. Rose of Lima while continuing as Pastor of St. Athanasius. A shared Pastoral Team was formed to minister to both parishes. Father Rob instituted and encouraged the sharing of parish liturgies and services. Daily Mass is held at the St. Athanasius Chapel. Holy Day Masses, Parish Missions, Holy Thursday Liturgies, Good Friday Liturgies and Reconciliation Services during Advent and Lent are shared. September 2010 The Religious Education Program, Sacramental Preparation Program, RCIA Program and Family Ministry of St. Athanasius welcomed the addition of St. Rose of Lima participants, teachers and catechists. October 2013 The Parish Office at St. Athanasius welcomed the secretarial staff from St. Rose of Lima to form one Parish Office with a shared support staff. January 2014 Father Rob directed the Embracing Our Mission, Shaping Our Future Campaign, a Archdiocesan capital campaign. The funds raised were designated for an Endowment Fund for the upkeep and maintenance of the Old Church Chapel. March 2015 A shared bulletin was created for the two parish communities of St. Athanasius and St. Rose. November 2015 Parish Councils from both communities were brought together for joint meetings. June 2015 The 125th Anniversary Committee was formed to begin planning events for the parish’s 125th Anniversary, which will begin in April 2016. May 2016 Father Rob celebrated his 25th Anniversary of priesthood.